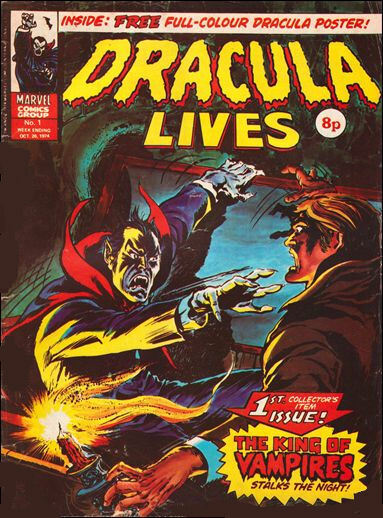 Comments: Marvel UK launched Dracula Lives on 26th October 1974, the same week as another title, Planet of the Apes; they were Marvel UK's 4th and 5th titles. Taking a departure from the other stories thus far reprinted by Marvel UK, Dracula ventured away from Marvel's superhero titles to the new 1970s horror comics, reprinting Dracula from Tomb of Dracula as its lead strip, with back-ups initially from Marvel Spotlight's Werewolf by Night tales, and later Frankenstein Monster, the Living Mummy, Man-Thing, Ghost Rider and Son of Satan. Reflecting this, the comic's title modified to Dracula Lives featuring the Legion of Monsters with #60. The final issue of Dracula Lives, #87, was released on 16th June 1976; a week later it merged into Planet of the Apes, creating a somewhat bizarre combination of apes and vampires.